JACOB KIRCHER, a wealthy resident of Shelbyville, was for many years actively engaged in farming, but he now lives in retirement, though he still owns one of the choice farms for which Shelby County is justly noted. He is a native of Wurtemburg, Germany, October 20, 1827, being the date of his birth. His father, whose name was Louis Frederick Kircher, was also born in that place, as was his father before him. The latter came to this country in 1834, and spent his remaining years in Maryland. The father of our subject learned the trade of a shoemaker in his youth, and with the exception of the time that he was a soldier in the German army, he followed his calling in his native Wurtemburg until 1829, when, ambitious to better his condition, he emigrated to this country with his wife and four children. He landed at Baltimore with empty pockets, and what was worse, in very poor health. He was fortunate enough to obtain the assistance of friends, by whose help he went to Hagerstown, where he found employment in a livery stable. He worked faithfully, frugally saved his money, and his wife also worked hard, and after a time with their united earnings they had enough to buy a horse and wagon, with which they started for Ohio, taking with them all their earthly possessions. They walked the greater part of the way, camping and cooking by the roadside whenever they were weary, and when they arrived at Lancaster, Ohio, they decided to proceed no further. Mr. Kircher looked about for a suitable location, and finally selected forty acres of land belonging to the Government situated in Hocking County, ten miles from Logan, the county seat. He did not have money enough by fifty cents to pay for his claim, but he obtained it by mending a pair of boots, and then walked to the land office to enter his land. His homestead was heavily timbered and he had to cut away large forest trees to make room for a cabin, which he built of logs, covering the roof with boards rived by hand and held in place by weight pole-, the iloor being made of puncheons and the chimney of earth and sticks. The father was a man of remarkable industry and not only labored in the day time, working hard to clear his land, in which he was assisted by his wife and children, but he employed his time in the evening making shoes, and thus earned the money to support his family. The older children soon went out to work, receiving their board and their clothes for their services, while our subject was left at home to assist his parents. He and his mother cut the first crop of wheat, she using a sickle and he a butcher knife. The family prospered and the father was enabled to buy eighty-five acres of land adjoining, and in time improved a valuable farm, upon which he lived until his death at the ripe age of seventy-nine years. His wife survived him some few years and then died at the home of her daughter in Richland Township, this county, at the venerable age of eighty acres. This worthy couple were the parents of six sons and one daughter, named as follows: Louis, John, Godfrey, Jacob, Mathias, Philip and Hannah. John and Mathias reside in Richland. Louis, Philip, Godfrey and Hannah are deceased. 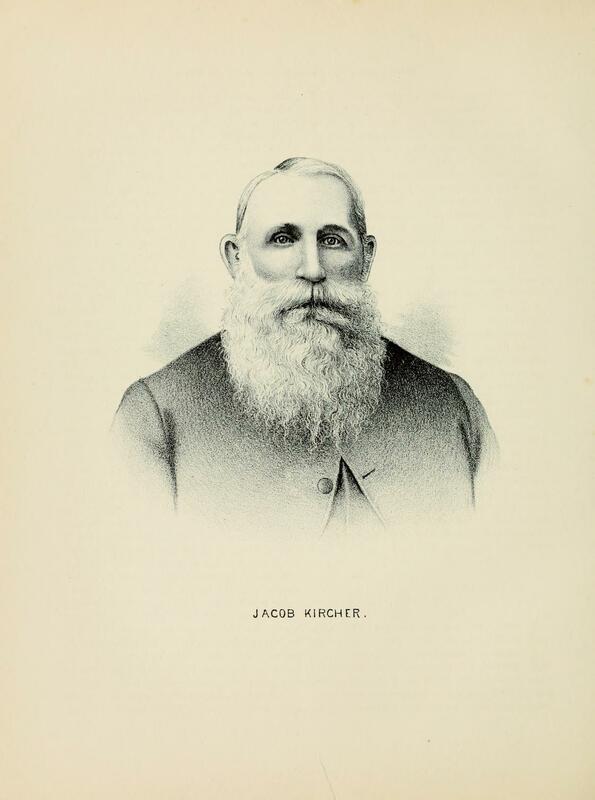 Jacob Kircher was only two years old when the family came to America, so that he has but little or no recollection of other than his adopted home. Just as soon as he was large enough, and that was when he was very young, he began to assist in clearing the land and tilling the soil of his father's homestead. He remained an inmate of the parental household until his marriage and soon after that all-important event, in company with his brother-in-law, he bought one hundred acres of land near by, on which was a set of log buildings. He and his brother-in-law farmed together on that place until 1855, when he sold his share of it, having decided to settle in the fertile farming regions of Illinois. Accompanied by his wife and two children, he journeyed across the country from Ohio to this State with a pair of horses and a wagon, and on his arrival in this county he invested all the money he had in forty acres of land in Ridge Township. This purchase included a primitive log cabin, which had an earth and stick chimney, a puncheon door, and two doors, but had no windows. Our subject and his family, and his brother and family spent the winter of 1855-56 in that rude structure, doing all their cooking by the fireplace, cornmeal being their chief diet. Mr. Kircher had been reared to habits of industry and economy, was possessed of good judgment, and moreover had been fortunate in the selection of a wife who afforded him material assistance in his labors, and his wealth steadily increased. He bought other land at different times and the old farm upon which he settled so many years ago, and which is still in his possession, now contains three hundred acres of well-improved land, amply suppled with good buildings and everything necessary to carry on agriculture successfully, and besides this he owns valuable city property. He continued to live on his farm until 1891, when he removed to Shelbyville, where he has since made his home in retirement from active business. A life of honesty and uprightness has won him the esteem of all who know him, and he is regarded as one of our most trustworthy citizens. He and his wife and all of their children are members of the Lutheran Church, and have done much to help their pastor and fellow-members to make it a power for the advancement of religion in the community. Mr. and Mrs. Kircher were united in marriage in 1852. Mrs. Kircher, whose maiden name was Rosanna Phipher, is a native of Ohio, born April 25, 1832, and a daughter of John and Magdaline Pipher, who were natives of Wurtemburg, and pioneers of the Buckeye State. Our subject and his wife have been blessed by the birth of the following children: Lena, wife of William Roof; Hannah, who married John Kimmel and died at the age of twenty-four years; Matilda, wife of John Kniller; Theodore; William; Mollie, wife of Theodore Warner; and Philip. The reader's attention is invited to the lithographic portrait of Mr. Kircher presented on another page. Extracted 09 Apr 2018 by Norma Hass from 1891 Portrait and Biographical Record of Shelby and Moultrie Counties Illinois, pages 490-492.